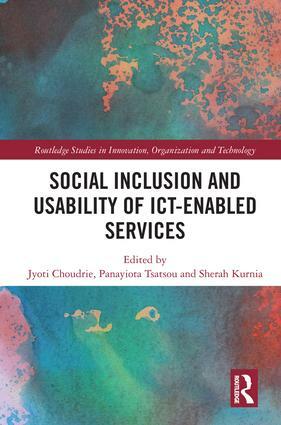 Social Inclusion and Usability of Innovative ICT-enabled Services is a cutting-edge research book written for researchers, students, academics, technology experts, activists and policy makers. The book explores a wide range of issues concerning innovative ICT-enabled digital services, their usability and their consequent role in social inclusion, It includes the impacts of the use of ICT-enabled digital services on individuals, organisations, governments and society, and offers a theoretically informed and empirically rich account of the socio-technical, management and policy aspects of social inclusion and innovative ICT-enabled digital services. This publication offers insights from the perspectives of Information Systems, Media and Communications, Management and Social Policy, drawing on research from these disciplines to inform readers on diverse aspects of social inclusion and usability of innovative ICT-enabled digital services. The originality of this book lies in the combination of socio-technical, management and policy perspectives offered by the contributors, and integrated by the editors, as well as in the interdisciplinary and both theoretically framed and empirically rich features of the various chapters of the book. While providing a timely account of existing evidence and debates in the field of social inclusion and technology usability, this book will also offer some original insights into what practitioners, experts and researchers are to expect in the near future to be the emerging issues and agendas concerning the role of technology usability in social inclusion and the emerging forms and attributes of the latter. Through a collection of high quality, peer reviewed papers; Social Inclusion and Usability of Innovative ICT-enabled Services will enhance knowledge of social inclusion and usability of innovative ICT-enabled digital services and applications at a diverse level. Jyoti Choudrie holds the position of Professor of Information Systems at University of Hertfordshire, UK. Panayiota Tsatsou is an Associate Professor at the University of Leicester, UK. Sherah Kurnia is a Senior Lecturer at the School of Computing and Information Systems, the University of Melbourne, Australia. The books in the series offer groundings in central elements of the management of technology and innovation. They provide stimulating treatments of key themes which form part of the Management of Technology and/or Innovation syllabus and are primarily aimed at advanced undergraduates, postgraduates and lecturing and research staff. The books explain, develop and critically explore issues and concepts on the assumption that students and staff already have a basic understanding of the area. All the books in the series incorporate a combination of this review of the current state of knowledge in a particular aspect of the management of technology/innovation with the presentation and discussion of new primary material not previously published.